Defined as less than three stool movements per week, constipation blocks new nutrients from passing through your body and can lead to compounding health consequences. So in addition to potential health issues causing your constipation, leaving it untreated could add complications, which can make identifying the original cause of the constipation difficult. This is the compounding nature of constipation due to the fact that it impacts overall gut health, which is why it’s important to bring it up with your doctor. In this six-part series, we are investigating the different causes of constipation so we can help you identify the problem and find you lasting constipation relief. In parts one through four, we looked at low hydrochloric acid, low bile flow, and dysbiosis (imbalanced gut microflora). You can read part 1, part 2 and part 3 from Dr Klimenko’s blog. 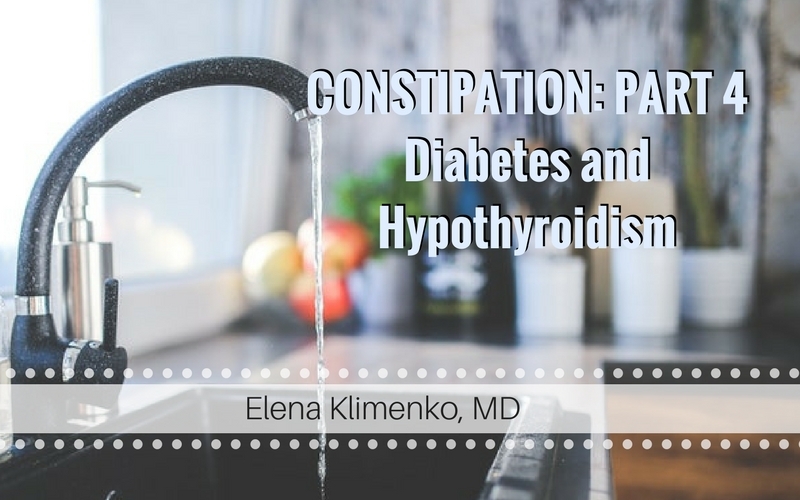 In part four of this series, we are going to look at the different metabolic disorders that can cause chronic constipation. We will examine diabetes and hypothyroidism and examine how we can influence better digestion despite these disorders. What helps constipation is completely dependent on the underlying cause, so let’s take a closer look at constipation caused by metabolic disorders. Constipation is the most common gastrointestinal issue in America, impacting as many as 63 million people. Nearly everyone will experience constipation at some point in their life. In fact, you shouldn’t worry about your constipation unless it lasts longer than 10 days or it becomes a reoccurring issue. A metabolic disorder can occur when there are abnormal chemical reactions occurring in the body (such as hormones), which then alter metabolic processes. Metabolic disorders may be present when you born or may be developed or diagnosed later in life. Gut microflora is very important to metabolic processes, so it shouldn’t come as a surprise that constipation would be a symptom that commonly accompanies metabolic disorders. The two metabolic disorders we want to focus on are diabetes and hypothyroidism – these are well known to cause chronic constipation if go undiagnosed and untreated. Constipation in diabetics is a common complication of the disease. Poor blood sugar control, nerve damage, and medications are all factors of diabetes that can lead to constipation. Studies have found that people with diabetes are 60 percent more likely to experience constipation. When your constipation is related to diabetes, in conventional medicine your treatment will be to focus on long term solutions, which may include stool softeners and laxatives. When there’s elevated sugar level in a diabetic, this slows down digestion and peristalsis of the intestine so sugar does not absorb into the bloodstream too fast, which further increases overall blood sugar levels. This is your body’s innate defense mechanism trying to reduce the rate of sugar elevation after the meal. Lifestyle choices regarding diet and aiding your body in metabolism regulation is going to be the solution to helping reduce your constipation episodes. Work closely with your doctor to manage these metabolic processes and listen to your body to work with it, not against it. If you’re diabetic or suffer from constipation and suspect you’re diabetic, it’s important to make an appointment with your doctor to look into these suspicions. Also keep in mind that the earlier you catch your diagnosis and implement necessary changes the better because you can prevent damage and work to counterbalance the impact of your diabetes. Constipation is often one of the first apparent symptom of an underactive thyroid (hypothyroidism). Your thyroid is responsible for producing important hormones that impact your metabolism and when there isn’t sufficient production it can cause the muscles that move your stool through the gastrointestinal system to become weak. If you have already been diagnosed with an underactive thyroid, it’s also important to look at your gut health if you are experiencing chronic constipation. Certain gut bacteria is essential to converting T4 hormone to T3, which is needed for proper metabolism and digestion. Have your doctor check your thyroid if you experience regular issues with constipation. Unlike low stomach acid, where we recommended an apple cider vinegar test, you’ll have to be tested in-office for metabolic disorders. How to get rid of constipation completely depends on the cause, so get tested early and you may save yourself a lot of discomfort down the road. Your certified functional medicine doctor is your best ally in helping you figure out how to get rid of constipation once and for all. Treating constipation alone means you’re only treating the symptom and not the underlying cause. If you want long term relief, especially if you suspect your constipation is due to a metabolic disorder, see your doctor and get a diagnosis earlier rather than later. Check for thyroid issues and diabetes if you experience long lasting or chronic constipation. And be sure to tell your doctor how often and for how long you’re affected by constipation to help them gain a clear understanding of you condition. Your certified functional medicine doctor helps you identify the underlying cause and build a comprehensive treatment plan so you can find lasting comfort and relief. Elena Klimenko, MD, a certified functional medicine physician, will help you choose the right course of action to identify the root cause and relief your unsettled symptoms. Call today to find out more about functional medicine and speak with Dr. Klimenko at 212-696- HEAL(4325).